Our first two players making the line up come from the match between Marown A & Castletown A with John ‘Chunky’ Gelling making it for his performance during his 21-9 win over Nathan Cooil and Mike Hargraves for a brilliant win over Neil Withers. George Peach makes it for Town B whilst Douglas Man Ian Moore Make his second apperance in the line up. Another man making his second appearance is Onchan’s Peter Slinger who makes it along with team mate Matthew Quirk for their respective hard fought wins over Peel. Juan Hargraves makes it for a 21-0 home win whilst Ballaugh’s John Keenan makes it for his 21-10 away win in the same match. Peel B’s Jack Lee and Gordon Corrin are first in our line up after thier teams great result over Onchan B. Despite losing out on the agregate points 2 Douglas B men have made it for great wins away from home with Pat O’Donohue & Ray Osborne making it in. Lawrence Doogan of Nobles Park A makes it thanks to a great 21-10 win. Keith Fearnley (Finch Hill A) picked up a superb 21-4 win away at the Mooragh to make ir along with Jimmy Moffatt of the homeside for his 21-6 performance. Milton Cubbon (PSM B) joins the line up which is completed by clubmate Thomas Keggen (PSM C), making his second appearance in the team, after they both picked up solid away wins. Depsite not being the biggest winner John Kelly (Marown B) was simply on fire in his performance and is the first name on our team sheet. He is joined by Howard Corlett (Douglas C) for his 21-8 win. Young Sam Stannard (Onchan C) is the next name on our list for a great 21-12 win away at Peel. Port Erin B were unstopable against Nobles and both Peter Blower and Ben Mowle earn their place. The match between PSM D and Peel D has given us two members of our side with Tom Wilson and Ray Hardman making it for their respective teams. The final place goes to Alan Moore from South Ramsey B as he makes his first appearance in our side. There was some tremendous bowling in the team event at South Ramsey on Sunday with ‘Its All About the Length’ running out winners over ‘Lil’s Legacy’ in a hotly contested final. The team of Bob Clark, Mark Kneen, Michael Collister and Neil Withers had just enough to see out a 60-56 win over the family team comprising matriarch Lillian Slinger, her daughters Janet Monk and Chris Price and grandson Robert Monk in a fiercely fought finale to an epic days bowling. The eventual victors didn’t have things their own way in the final however with one singles game level, being 12-7 down in the doubles and Neil Withers trailing 16-12 to Janet Monk things looked bleak. The pendulum of momentum however swung and with Michael Collister finishing off his singles game 21-17 against Chris Price and Withers scrapping to a great 21-18 win it left them firmly in the driving seat and at 18-12 up in the doubles to job was done. Credit must go to Lillian Slinger and Robert Monk who managed to see out a magnificent 21-18 win in the pairs. Fallers at the semi-finals stage were ‘Rosemary’s Boys’ (Kevin Quirk, Roemary Quirk, Matthew Quirk & Glynn Hargraves) and Misserabowls (Alan Moore, Andy Kennish, Dave ‘Dido’ Kelly and Stefan Kelly). South Ramsey put on another first class competition on and praise must go to the green keepers for a simply immaculate playing surface. 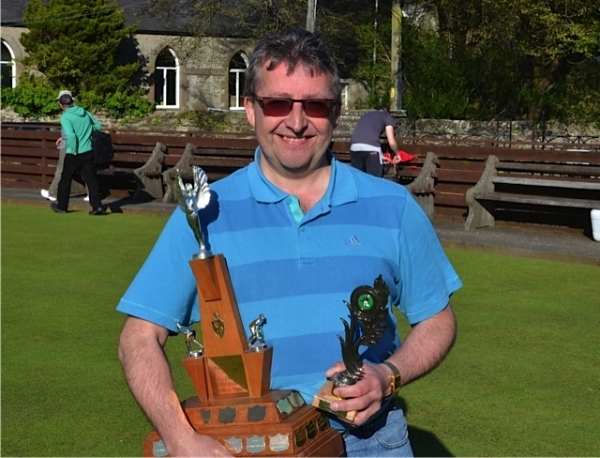 It was a case of déjà vu for 1996 Island Champion Gary Conwell as he won the Henry Kissack trophy at Marown on Saturday for the third time. Conwell, who’s last open success came in this very same competition in 2009, was in imperious form all day but saved his majestic best for the final where he beat Michael Collister 21-11. He was unplayable in the final and every time it looked like Collister would get a foothold to climb back into the game he produced winner after winner to claim the title. Collister should also be lauded for exploits on the day and particularly his 21-17 semi-final win over Castletown stable mate Aaron ‘Bob’ Clark. Conwell knocked out home greener Brian ‘Boothy’ Kelly at the same stage. Losing out in the quarter finals were Arnie Withers, Phil ‘Rambo’ Kelly, Bobby Thorne and David Proctor. Marown bowling club should once again be congratulated for putting on another superbly well run competition. Castletown B produced one of their finest ever displays in Isle of Man Bank Men’s division one last week with a brilliant maximum 10-0 home victory over high flying North Ramsey A at the Crofts. It is hard to quantify just how rare it is for a side outside the top 2 or 3 teams in each division to record a whitewash, especially against quality opposition such as the Northerners who beat their A team 8-2 in the previous fixture. On paper, before the match, they looked like they could sneak a home win but for every one of their players to dig to unknown depths and secure wins, 5 of them either 19 or 20, is quite simply awesome and the Town lads deserve every accolade afforded them. Town A, however, didn’t fare as well on their trip to Marown as they went down 9-1, with Mike Hargraves 21-15 over home captain Neil Withers the main highlight for them. This is a great result for the Crosby men and keeps them hot on the heels of league leaders Onchan A.
Castletown C are holding their own in the top flight and another 4 points at home, this time against the other newly promoted team Port Erin, keeps them in the battle for survival. Port, who are also faring well in the seasons early stages, will leave the happier though as they edged the match on aggregate to pick up a vital away win. Playing at a temporary home does not seem to be affecting title favourites Onchan A and they put in a great display to beat Peel A 9-1 at the cattery and get their title aspirations very much on track. The Govags will feel hard done by to not have left with more after what was a highly competitive and entertaining encounter. Jack Beecham was the visitor’s only winner and he will be delighted to have gotten the better of Jordan Cain, especially on a green where the Onchan man was undefeated in the winter league. Port St Mary A have started the season very strongly indeed and a strong 8-2 win, this time at the expense of Ballaugh A, keeps them fighting it out near the top of the tree. Strong home form is expected from this class act but it will be how they perform on their away trips which will determine their final league position. Ballaugh find themselves in a bit of deep water at present and will be hoping to get some more points on the board soon. South Ramsey A bounced back from last week’s defeat with a solid 7-3 away win over Douglas A at the Villa Marina. South should be in the hint this season and if they can eradicate the odd bad result and find some consistency they have a genuine shot at top honours. Finch Hill A find themselves at the top of division 2 after a hard fought 6-4 win away at the Mooragh over North Ramsey B. Both of these sides are fighting it out at the summit and there were some good performances from both sides. Onchan B were in pole position before their match in the Sunset City against Peel B where they were stunned and left licking their wounds after the home side produced a brilliant 8-2 win, dropping Onchan down to fourth overall. A rejuvenated Nobles Park A continued their fine start to the season and move into second place after a strong display to beat Castletown D 8-2. The third division is the most open and unpredictable tier this season and I think the lead will switch hands on multiple occasions before the end of the season. Port Erin B currently occupy top spot after a massive 9-1 win over Nobles Park B. The Nobles team might be struggling to put points on the board in these early stages of the season but I had the pleasure of watching some of their match in the Rayner Shield and its brilliant to see so many new faces taking up the sport. South Ramsey B and Marown B both won 6-4 at home to keep them in the fight for silverware and they now occupy second and third spot respectively. The lead in the race for the 2014 Tower Insurance Over 60’s Championship has changed after surprise early leaders Onchan B hit the buffers this week firstly losing at home to visitors North Ramsey A by 5 games to 3 then losing by a similar score on their visit to South Ramsey. This has allowed Castletwon A to gain top spot with a 7-1 home victory against Peel A followed by a visit to their bogey team Port Erin where they came away with the points in a 6-2 win, right on Castletown A’s tail come Port St Mary A and Onchan A both just a point in arrears, Port St Mary had a good home win over neighbours Port Erin by 7-1 and then followed this up with a excellent but very close 5-3 win at the Mooragh against a always difficult to beat North Ramsey A. Onchan A had a far better week than their B team and moved ahead of them by a position and point, firstly a shared point at Douglas A in a close 4-4 encounter, before using their adopted home advantage to see of Ballaugh by 6 -2. The teams how in 5th and 6th places both on 11 points Marown and Castletown B both had 5-3 wins on the Tuesday, Marown at home to Finch Hill B while Castletown B just made it after the last game went in their favour 21-20 to beat North Ramsey B at the Mooragh, it was a bit de jay vu when Marown visited the Crofts to play Castletown B with the town again winning the last game 21-20 but this time it was to share the points against a very good Marown outfit. Noble’s Mixed held South Ramsey to a draw at home on the Tuesday then completed a good week with a 6-2 win against Douglas B at the Villa. Noble’s Park pulled off a major surprise by getting both points against Douglas B at home on Thursday in a close 5-3 victory, while Peel B eventually got their points score on the move with a home victory over a depleted Douglas B on Tuesday, while Finch Hill B also got their first points on Thursday by beating Peel B by 5 games to 3. Port St Mary B had a poor week losing to Ballaugh and then at home to North Ramsey B by 5 games to 3 in another close game. The Merit Table now sees the number of players having played every game and won every one drop from 6 to 3 with Peter Kelly (Marown), Dave (Fagsy) Faragher (Castletown A) and Dave Foulis (Ballaugh) being the 3, two players have played 7 and won 7 they are Chas Grills (S Ramsey) and Collin Holland (Castletown A), which I think shows what a competitive league we have. The Mini Cup first Round was played this week and the clear favourites after the super start to the league Onchan B visited Peel B and came away with a 6-3 win, Port Erin had a good 7-2 win over neighbours Port St Mary B, while North Ramsey B just managed to win at Noble’s Park with a 5-4 score line and a game they won 21-20, while Douglas B had to concede their game against Finch Hill B at Finch Hill. So this leaves Finch Hill B, Onchan B, Port Erin and North Ramsey B as the teams that will go in the hat for the Semi Final Draw. There was an entry of 31 for the Pearl Kaighin ladies’ singles open played in the sunshine at Ballaugh on Saturday 26 April. Despite some tricky marks the green was running well giving excellent bowls and some very close matches. In the first semi-final Rita got off to the better start at one point leading 18-14 before Maureen fought back to come through and win 21-19.In the other the scores were level at 10-10 when Gill won seven of the next nine ends to lead 19-12. Janet won the next three ends before Gill got the jack back and ran out 21-16. Semi-finals: Maureen Payne 21, Rita Callan 19; Gill Dixon 21, Janet Monk 16. The presentation was made by Bernard Kaighin who thanked everyone for coming. He gave special thanks to Jenny for running the sheet, the ladies for their work in the kitchen and to the green keepers for the condition of the green. It was a miserable wet night for the C Tarleton Hodgson and Son Ltd ladies’ league on Friday 25 April. 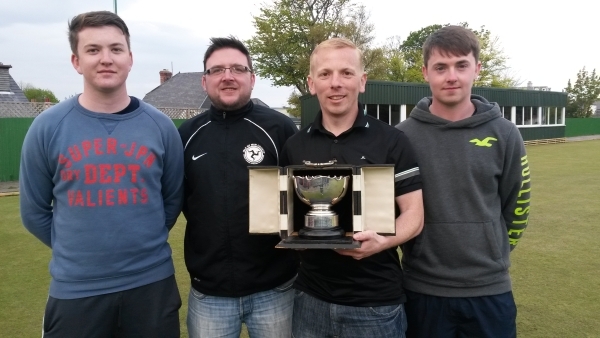 After their heroics in the Jean Kelly Competition on Wednesday night, Port Erin travelled north to meet Mooragh Park for a second time in the week. History was not to repeat itself as, on their own green, The home side proved too strong for their visitors, winning 6-3 on games. The three winners for Port Erin were Sylvia Maddrell, Voirrey Curphey and Caroline Whitehead who won to single figures, as did three of the home team. Onchan were unfortunately a player short on their trip to Noble’s Mixed, and fell just short of 100 points as the home side piled on the pressure winning six games, three to single figures. The winners for Onchan were Heather Reynolds, Viv Rush and Phyllis Gelling who edged out Sylvia Kennaugh 21-19.Port St Mary did not have it all their own way against Purt le Moirrey coming through 5-4 in a low scoring match with the home team winning two games to single figures and the visitors one.The games all went to double figures at South Ramsey where the home side had a 6-3 advantage on games. For Ballaugh Voirrey Oates reached 19 against Casey Bolton while Maureen Trustham was pipped 21-20 by Jenny Moore. Peel Sunset showed the value of fighting for every point as despite losing 7-2 on games to Douglas they recorded a reasonable score with three games going to 19 and one to 18.Heather Horsburgh and Joyce Kelly, to single figures, were the two winners for the visitors. Castletown were too strong for Marown, winning six games, three to single figures. The winners for Marown were Celia Joughin, Lil Smith who edged out Kim Foy 21-19 and Mary Alderson who won to single figures. The preliminary round of the Jean Kelly Took place on Wednesday 23 April, The game between Onchan and Port St Mary had to be postponed because of a water-logged green at Finch Hill. The holders, Mooragh Park, travelled to Port Erin where things didn’t go their way, the home side winning five of the nine games with three of their players winning to single figures. With Chris Price also winning to singles figures the chalks ended all square at 146 each before Port Erin’s +40 handicap came into play to give them the match. There were some close games, particularly Caroline Whitehead edging out Jean Radcliffe 21-20. Castletown proved too strong for Ballaugh winning six games, five of them to single figures. Voirrey Oates and Christine MacDonald also won to single figures, Ann Gale being their other winner. With the score at 156-107 on the green even Ballaugh’s handicap advantage could not save them. With Douglas winning six games, three of them to single figures, and their other three players reaching double figures, they went through by 15 points after the handicaps kicked in. A high point of the match was the game between Paula Garrett and Pauline Worrell, the home player scraping through 21-20. There were no maximums recorded in the Trend sponsored ladies’ over 60’s league on Tuesday 22 April. The top three teams all won five of their six games with Mooragh Park leading the way with a score of 125 against Marown, Shirley Whelan spoiling the party by edging out Mary Kinrade 21-20. League leaders, Port St Mary A also won five games, scoring 120, with Val Macfarlane and Rita Callister winning to single figures while Meg Williams was the lone winner for the visitors. Pauline Worrall was the star for Port St Mary B, taking a game off third-placed Peel Sunset who scored 115 with Rose Corfield winning to single figures. Ballaugh drew on games with Douglas, but wins to single figures by Maureen Trustham and Peggy Griffin gave them a comfortable win on points. The closest game of the match was the tussle between Mary Simmonds and Elaine Vincent with Elaine coming through 21-19. Villa had the better of Onchan B, winning 4-2 on games with Peggy Chapman and Kay McKiernan winning to single figures while the two winners for Onchan b were Viv Rush and Dee Lewis who also won to single figures. It was a hard fought match between Onchan A and Port Erin with all six games going to double figures. The home side had the advantage 4-2 on games with the star match being that between Phyllis Gelling and Hesba Skelly where Phyllis just edged through 21-20..
Raise a glass to Port after victory over South! There was both a case of business as usual and shock results in the Isle of Man Bank Men’s league division 1 last week. Reigning champions Marown A were in devastating form at home against Ballaugh and bounced back from defeat in their season opener to secure an impressive 10-0 maximum win to get their season off and running. Favourites to secure the title, Onchan A, were equally as imperious with their own maximum over Port Erin at their temporary home at the cattery. Although they were on a different green the result was the same and I really think they might have too much for their rivals this time around. Castletown A were top of the tree after week 1 but this was short lived as they were brought down to earth with a bang by in-form North Ramsey A who beat the southerners 8-2 at the Mooragh. There is a mix of old and new in the North first string this term and it seems to be doing the trick with both new boys and regular faces on the top of their game. Port St Mary A were on the money at home against title contenders South Ramsey A drawing on games but picking up the win 6-4 thanks to the aggregate points. Highlight of the match was Chris Oates 21-6 win against 3 times Island Champion Andy Kennish. Oates was simply unplayable for the entire match, and you will do well to see a better individual performance all season. Douglas A picked up their first win of the season over Peel A at the Villa, but only just. The elixir drinkers managed a draw on games but edged the match on aggregate to get some much needed points on the board. It was derby day number 1 at the Crofts as Castletown C hosted their B team with the latter being too strong for their opponents, running out 8-2 victors. It’s too early to tell who will win and who will finish in the relegation places come September however things are looking ominous with Onchan A already 4 points clear of the chasing pack and it will take some twists and turns to reel in this deficit. Onchan B are the early pace setters in Division 2 after a highly impressive 9-1 win away at Finch Hill B. They are serious contenders for promotion this year and will be hoping to build on their strong start. Newly promoted North Ramsey B are hot on their heels though and a second win, this time 7-3 over Nobles Park A, has set them up nicely for a shot at back to back promotions. Finch Hill A will have something to say about it though as they picked up a great 9-1 victory away at Ballaugh B to keep them on the promotion trail. South Ramsey B lead the way in Division 3 after they took out Onchan C 8-2 at home to keep their championship bid very much on track, even in these early stages. They are the class act in this division and should be there or there abouts at the end of the season. Marown B might have something to say about where the silverware goes at the end of the season and if the keep up the form that they displayed in their 9-1 win over Douglas C will be a force to be reckoned with.